“Alla ricerca di luce e chiarezza”. 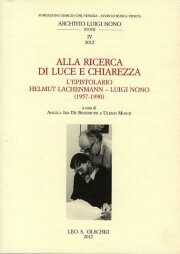 L’epistolario Helmut Lachenmann – Luigi Nono (1957-1990) (“In Search of Light and Clarity. The Helmut Lachenmann–Luigi Nono Correspondence”), edited by Angela Ida De Benedictis and Ulrich Mosch, brings together over 121 documents – letters, postcards, telegrams, etc. – exchanged over around thirty years by two leading figures on the contemporary music scene. This latest book in the “Luigi Nono Archive Studies” series charts the development of an unusually intense and important artistic and human relationship. Having begun with teacher-student exchanges, their relationship continually developed over time, despite disagreements, long silences and momentary misunderstandings. From the initial discussions on composing technique and music poetics in the 1950s and ‘60s to letters with a rare emotional intensity in the 1980s, what emerges from their correspondence is the same passion for “making” and “experiencing” music and a deeply felt commitment shared by both men, albeit with at times different results and emotions. The documents are published in their original language, while the story of this exceptional correspondence has been entirely reconstructed by the editors. There are also three appendices: i.e. some letters written by Lachenmann to Nono which, for various reasons, were never sent; nineteen letters written by the two correspondents to other leading personalities on the music scene in the second half of the twentieth century; and, lastly, a collection of seven mostly previously unpublished texts by Lachenmann on Nono, written for various occasions from 1957 to 1974. The entire correspondence and accompanying documents were collected as the result of research conducted at the Fondazione Luigi Nono, Venice, the Paul Sacher Stiftung, Basel and various other European archives.